Enjoy a refreshing summer treat on Berryburst Slot at Vegas Spins, your favourite online casino! It is a beautifully crafted game by NetEnt, coming with 5 reels and the Cluster Pays™ engine. It is indeed a delight to watch delicious fruit symbols spinning on the reels! The game is set against a pink backdrop with the following symbols on the reels; Orange Slices, Raspberries, Limes, Berries, Hearts, Spades and Diamonds in bubbles. Make the most of this delicious-looking game at Vegas Spins using a PC or mobile phone. Choose your preferred coin size on Berryburst Slot using the + and – buttons on the Coin Value field. On the Level display, you can pick your preferred bet level. If you want to go for the highest bet in a single click, simply press the “Max Bet” tab. Click on the Spin button to begin. An Auto Play feature is also available for you to launch a maximum of 1000 automatic spins. Bet Levels: Select 1 to 10 bet levels for your gameplay. Amount of Paylines Selection: Since the Cluster Pays™ engine is used, there are no paylines. Coin Values: The bet values vary from 10p to £200 per spin. The wild card is represented by the Ice Cube on Berryburst Slot. It can take the place of any symbol to complete a winning combo. Look out for Expanding Wild symbols! They expand on any of the 5 reels while the others are re-spinning. When an Expanding Wild symbol lands on any reel, it activates the Re-spin Feature on Berryburst Slot. If one or more Wild icons show up during the round, an additional re-spin is awarded. This leads to the 5 reels turning fully Wild, awarding you 500x your stake. Plus, with continuous re-spins, you can trigger a maximum of 1868x your total stake. Since Berryburst Slot makes use of the Cluster Pays™ engine, a cluster of 5 or more symbols is needed to create a winning combination. 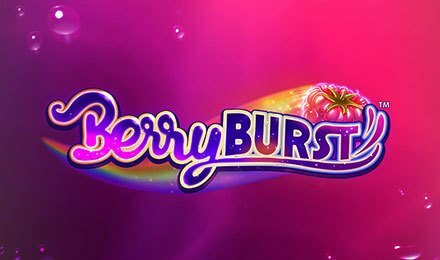 Enjoy a fruity gameplay on Berryburst Slot at Vegas Spins where a wide array of games is waiting for you. Good luck!